Bok Choy often pairs with Asian stir-fry, but I think the mild flavor lends itself to other regional cuisine. Here it’s added to Mediterranean pasta, cheeses, and herbs for a quick meal. I don’t have exact measurements because this is supposed to be fast – it will take as long as the pasta to cook – so just eyeball it. Get the water boiling for the pasta and begin to cook according to the package instructions. In a saute pan, heat to medium low, drizzle about a tsp of olive oil, and cook the mushrooms until softened and beginning to brown. You may want to cover if they are too dry. Remove cover if using and add the bok choy. Cook until just wilted. 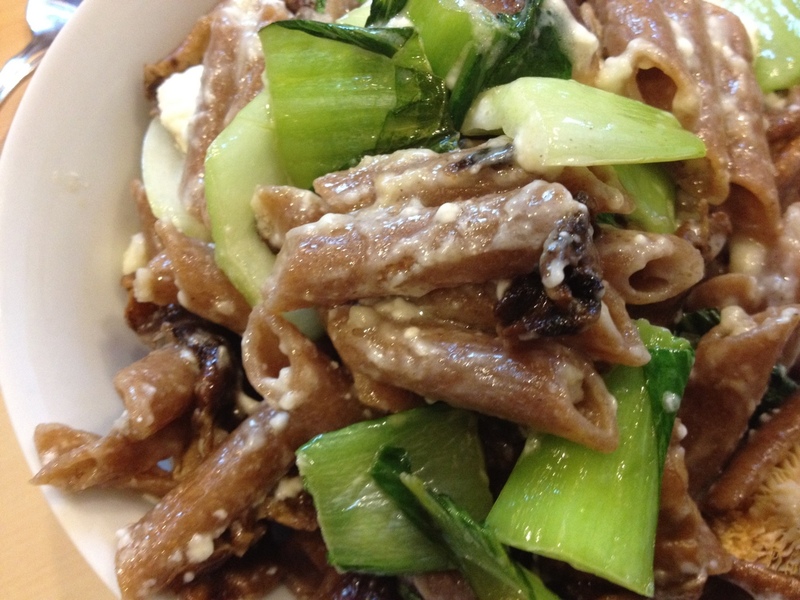 Add to mushrooms and boy choy to the pasta along with the cheese and another drizzle of olive oil. Right back at you! I’ve been trying to incorporate more vegetarian meals and am looking forward to trying some of your recipes. Thanks for visiting! YUMMY! What a great idea 🙂 I will have to give this recipe a try next time I get some be love bok choy. Thanks for the invitation… it’s always a pleasure and I learn another terrific way to use that happy box. Bok choy is such an awesome green to work with! I couldn’t agree more! Thanks for stopping by! I LOVE this idea! I get so tired of stir frys when I have bok choy over and over, so this is making my to-cook list for sure. That was exactly my inspiration. Enjoy!